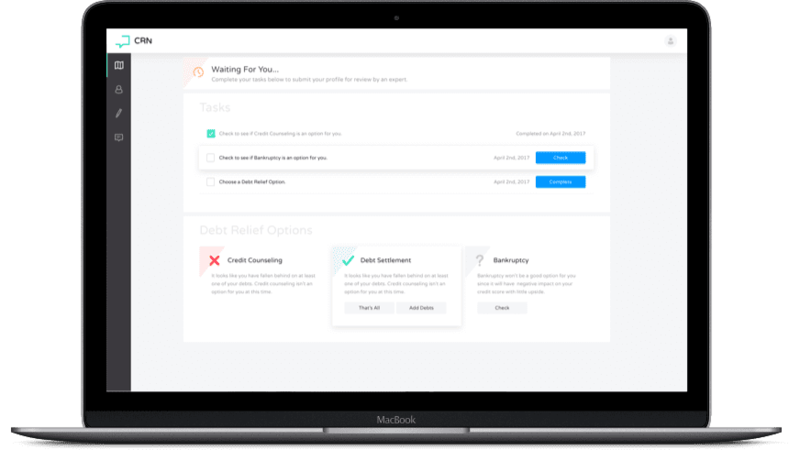 Select a service and gain access to tools and on-demand experts to help guide you through the debt relief process. Get started by selecting one of our services below. We need to collect some basic information from you to start. Log into your dashboard and complete your tasks. One of the most common paths out of debt is settling your past due debts with your creditors. We’ve built a tool that takes the guessing game out of figuring out which debt to pay first and a web-based negotiation tool so you never have to speak with your creditors over the phone. * Settlements that are settled through our platform are subject to a fee that is equal to 15% of savings from settlements. Sometimes you have multiple options of getting out of debt. Our experts will work with you to determine which is the best path and help you through each step of the way. This option is best for people who need help getting started on their debt relief journey. Our experts are here to help.